NAIROBI, Kenya, Dec 21 2010 (IPS) - While some countries like Liberia can boast that they have a female President, Kenya is still grappling with allowing women room to exercise their leadership roles in Parliament and at local government level. The legislature has 222 Members of Parliament, and of that, only 22 are women. Cabinet has 41 Ministers and 52 assistant ministers. There are only six women serving as Ministers and another six serving as assistant Ministers. When the Cabinet was set up in 2008, there were seven Ministers and five assistant Ministers. In Parliament, where numbers represent power, the lack of female representation remains a challenge in efforts to engender the political processes. Among the East African countries, Kenya prides itself as the strongest economy but it is one of the poorest performers in relation to the gender parity index. Other countries, especially Rwanda, have already achieved the global threshold of at least 18.8 percent women representation in parliament. “Countries such as Rwanda have an estimated 56 percent gender parity and has one of the best case studies of women representation in Parliament,” explains Ken Odour, a Political Scientist in Nairobi. Over thepast few years, women have become more aggressive in a bid to hold leadership positions, particularly in parliament. In the 2007 general elections, the number of female aspirants for parliamentary seats was 269 out of a total of 2,548 – a figure much higher than in 2002, where only 44 out of 1,015 attempted to get into parliamentary elective positions. In light of this trend, men have grown more insecure because they have dominated the political process for many years. “This is evident in the kind of violence subjected to women during the post election violence. Several female aspirants were threatened, assaulted physically and/or sexually. 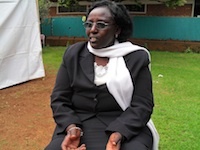 Some gave up along the way because of intense intimidation,” explains Alice Wahome, a politician from Central Kenya, who vied for a parliamentary seat in 2007. She was physically assaulted and was hospitalized. Although the current parliament has the highest number of women leaders and ministers compared to the previous regime, where women ministers never exceeded three at a time, unfortunately they do not hold positions in key ministries. The only ministry – that is close to the annex of power – to have been held by a woman is the Ministry of Justice and Constitutional Affairs. The then minister, Hon Martha Karua, who resigned a few months ago under claims of allegations that there were powerful individuals frustrating her efforts to engineer fundamental reforms, is credited with creating momentum that led to a successful Constitutional review process. “She also introduced the Affirmative Action Bill in 2009 which, although rejected by the House, was not in vain because there is an Affirmative Action Clause in the Constitution,” explains Alice Karanja, a businesswoman and an aspiring politician. Due to the small number of female ministers, it is difficult to access their impact because their access to budgets and other funds is limited. With regard to funds for various ministries, only six women have access and control over how the budget will be implemented. Some of the ministries under the leadership of women that have attempted to make headway towards improving the livelihood of women as a marginalized community include the Ministry of Gender and Social Development and the Ministry of Special Programs. However, this does not indicate that other Ministries are not making headway. There are many successes that women achieve as leaders but are never acknowledged because of their nature. Often, women are concerned with social services that include access to water, sanitation, nutrition and health. “Women leaders have been credited for the inclusion of the reproductive health Clause within the Constitution. This is because they understand the need for access to reproductive health in relation to development,” adds Alice Karanja. In Kenya there is a system where funds are devolved to Constituencies through the Constituency Development Fund Kitty. This kitty is under the control of the respective Members of Parliament for each constituency, with only 16 elected women in charge of various constituencies. This means that there are a limited number of women leaders who are able to channel these funds to needs, which are central to women’s interests. Despite the challenges women leaders at the national level face, they continue to soldier on and have formed an association called ‘Kenya Women Parliamentary Association (KEWOPA), whose membership consists of all women Members of Parliament. The vision of the association is to build a nation in which women and men are equitably represented in Parliament, while the mission is to contribute effectively to the formulation and enactment of gender responsiveness and policies.